I know I swore off game-used jersey cards, but could I have resisted this? Serial numbered 133/149, and a dual swatch (all white of course). Yummy. The only problem with this card is that it may make me want the single, triple, and quad cards. If I win the Mega-Millions tonight, I promise they are going to be purchased within minutes of checking my ticket. 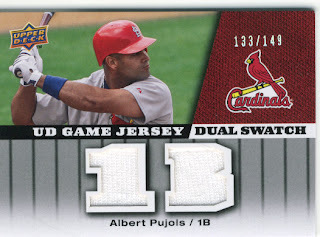 Albert was put into a PC-3 Snap case, which is how I store all of my PC game-used and autograph cards, and will be joining his friends in my 800 count box labeled PC Pujols. Welcome home, buddy.